In 1982 and 1983 and again in 1997 and 1998, well-recorded El Niño events turned the world's weather upside down. The west coasts of the United States and Peru received record rainfall and flooding, while hurricanes raged in Mexico, Hawaii, and Tahiti. Severe drought and heat struck Australia, Asia, Indonesia, and Africa, causing crop failures, starvation, and forest fires. El Niños are part of a recurring weather cycle that is beyond the control of humanity and appears to have occurred for millennia. Thanks to improved research abilities in recent years and the deployment of moored instruments to sense mid-ocean conditions, scientists are now able to better understand and predict these climate phenomena. 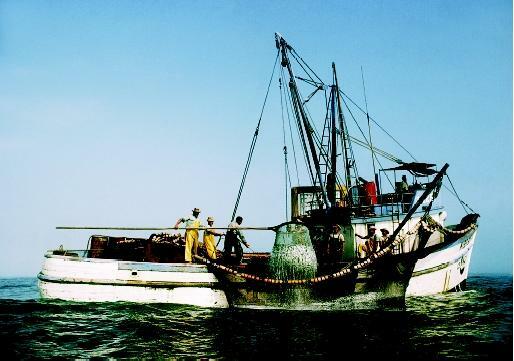 The anchovy fishery off the Pacific Coast of Peru has supported regional populations for centuries. Fishers noticed a periodic drop in their typically sizable anchovy catch that seemed to coincide with a dramatic warming of the ocean waters. This regularly began in December, near Christmas, prompting the fisherman to name the event "El Niño", for "the Christ child." On other occasions, the ocean waters would turn cold. This was termed "La Niña," or "the girl child." El Niño and La Niña events are most apparent in the equatorial Pacific Ocean, but similar events occur in the equatorial Atlantic Ocean, although at a lesser intensity. In the equatorial region, the Sun transfers maximum energy to surface waters of the ocean. Under normal, non-El Niño conditions, the trade winds blow toward the west across the surface of the tropical Pacific Ocean. These strong, constant winds push and drag the warm surface water westward, "piling" it up and holding it in the western Pacific Ocean basin. The sea-surface level is normally about one-half meter higher in Indonesia than it is in Peru. El Niño was named by Peruvian fishers who noticed that the warming of ocean surface waters reduced their anchovy catch. Here fishers pull a load of anchovies off the coast of Peru during normal ocean conditions. During the journey west, surface waters are heated by the Sun over a huge area west of the international dateline, known as the West Pacific warm pool. The sea-surface temperature is approximately 8°C (14°F) higher in the western waters, with cool temperatures off South America. The air over the western warm pool is also very humid owing to its long passage over the tropical ocean. When the warm air rises in the west, heavy precipitation is produced over Indonesia, leaving the Eastern Pacific relatively dry. With the removal of the warm surface waters, an upwelling current is created in the east Pacific Ocean, bringing cold water up from deeper levels. This cold water is nutrient-rich, supporting high levels of phytoplankton and zooplankton , diverse marine ecosystems, and rich fisheries. During an El Niño event, the trade winds relax in the central and eastern Pacific. Without the constant force of the wind to hold the warm waters back, the West Pacific warm pool begins to migrate easterly as the sea-surface level begins to equalize, an event termed an "El Niño/Southern Oscillation" (ENSO). These two pseudo-color satellite images show variable conditions in the Pacific Ocean in 1998 and 1999. Red and white are increased heat storage; purple and blue are low sea level; and green is normal conditions. in the Indian Ocean switch back and forth on a 3-year to 4-year cycle. Strong El Niño conditions coincide with low pressure over the Pacific Ocean, and La Niña coincides with the high pressure over the Pacific Ocean. The phenomenon is a product of the interaction between ocean and atmosphere. As an El Niño progresses, it produces a rise in the ocean's thermocline in the western Pacific and a fall in the thermocline in the east. This change reduces the upwelling of cool subsurface water and cuts off the supply of nutrient-rich cold water upwelling from below. The result is a dramatic rise in sea-surface temperature and a drastic decline in plankton growth, which is devastating to the marine food chain , including commercial fisheries in the region. With the weakening of the easterly tradewinds, humid air follows the warm water eastward, causing rainfall and associated flooding along the west coasts of North and South America and drought in Indonesia and Australia. The eastward displacement of the atmosphere overlying the warmer water results in dramatic changes in the global atmospheric circulation, which in turn force changes in the weather activity of regions far removed from the El Niño waters of the tropical Pacific. La Niña is less understood than El Niño, but it also can have a devastating effect. Under certain conditions, the trade winds are stronger than normal, causing surface waters in the equatorial Pacific to be colder than average, with upwelling occurring as far as the Central Pacific. Below-average sea-surface temperatures commonly occur following an El Niño and appear to be associated with weather events opposite that of El Niño. Monsoons in the Indian Ocean are wetter than normal while summers in North America are hot and dry. However, winters in northern North America have set records for cold temperatures and snowfall, with an increase in devastating tornadoes in the south during La Niña events. 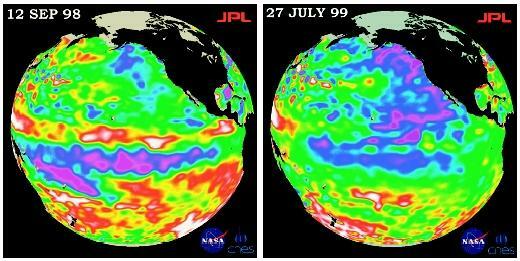 Climatologists have been perplexed about the occurrences of El Niños since they first were identified. Through comparison of the sea-surface temperature data extending back to the 1860s, it has been determined that the Earth's ocean temperature appears to pass through a 10-year cycle as well as the 3-year to 4-year cycle. Beginning in the mid-1970s, the equatorial Pacific Ocean began a period of warmer than normal sea-surface temperatures. This period was marked by a higher occurrence of El Niño conditions than normal. Other long periods of low El Niño or La Niña activity can be seen in the historical pattern of temperature anomalies. The following graph shows El Niño events (red) and La Niña events (blue) since 1960. The normal sea-surface temperature is expressed as 0°C variation. El Niño events can occur at any time and be of various strengths. A mild El Niño will affect only the equatorial Pacific Ocean. Strong El Niño events influence equatorial weather dramatically and often can be felt worldwide. El Niño events commonly alter the course of the atmospheric jet stream, which is responsible for driving the storm fronts. This produces unusual weather patterns in most parts of the world. Severe drought and forest fires are experienced in Australia, Africa, Indonesia, and Brazil. Heavy rains and flooding occur from the southeastern United States to Peru and Chile, with tropical hurricanes in the Pacific Ocean. Scientists use many techniques to measure the oceans. Data from multiple sources are combined to produce graphic images of changing ocean conditions. These sources of information include moored buoys, drifting buoys, tide-gage stations, satellite data relay, and volunteer observing ships. To learn more about equatorial ocean conditions in the Pacific, the National Oceanic and Atmospheric Administration (NOAA) deployed moored open-ocean buoys that track the sea-surface conditions. The Tropical Atmosphere Ocean (TAO) array consists of approximately 70 buoys deployed in a grid across the equatorial region of the Pacific Ocean. There are two types of buoys used in the TAO array. ATLAS buoys measure surface winds, air temperature, relative humidity, and ocean temperatures in the upper 500 meters (1,640 feet) of the water column. Equatorial Current Meter buoys include additional instruments to measure ocean currents, precipitation and ultraviolet radiation. The data from each buoy are transmitted to an observational satellite in orbit around the Earth and then transmitted to NOAA's Pacific Marine Environmental Laboratory. The raw data are analyzed and computer models are created, visually indicating present ocean conditions. The secret to discovering whether an El Niño or La Niña event is occurring is a little more complex. Climatology data from the historical record give a picture of the fluctuations in sea-surface temperature over the last 160 years. Averaging all of the data and determining the mean (average) sea-surface temperature for each day of the year produce a hypothetical set of statistically "normal" ocean conditions. Looking only at the present-day sea-surface temperatures will tell little until it is put in perspective with the assumed normal ocean conditions. The difference between current sea-surface temperatures and the normal temperature is termed the anomaly. By plotting the anomaly temperatures, scientists can obtain a precise idea of the intensity of change in sea-surface temperatures. This approach aids in the prediction of El Niño and La Niña events and produces data that will be used in the future to determine the level and speed of any change in climate that the Earth may experience. The data may also be used to forecast how changing ocean conditions may affect weather and climate systems worldwide. SEE ALSO Climate and the Ocean ; Fisheries, Marine ; Human Health and the Ocean ; Marine Mammals ; Moorings and Platforms ; OCEAN Currents ; Ocean Mixing ; Weather and the Ocean . Philander, S. George. Is the Temperature Rising? The Uncertain Science of Global Warming. Princeton, NJ: Princeton University Press, 1998. Prager, Ellen J., and Sylvia A. Earle. The Oceans. New York: McGraw-Hill, 2000. Thurman, Harold V., and Alan P. Trujillo. Essentials of Oceanography. Upper SaddleRiver, NJ: Prentice Hall, 1999. Coral bleaching occurs when the coral expel their symbiotic algae due to extreme stress. A severe bleaching event struck the corals of the Rangiroa Atoll in French Polynesia in 1998, one of the strongest El Niño years (1997–1998) recorded. Vast numbers of corals died suddenly during a record-breaking El Niño that raised sea-surface temperature 1°C over a 3-month period. Because extreme temperatures and solar irradiation are the main cause of coral bleaching, El Niño could have played a major role.